CRAZY COOL GROOVY!!! : DOCUMENTARY MOVIE TRAILER - ANDRE' LEON TALLEY: The GOSPEL ACCORDING To ANDRE'!!! DOCUMENTARY MOVIE TRAILER - ANDRE' LEON TALLEY: The GOSPEL ACCORDING To ANDRE'!!! 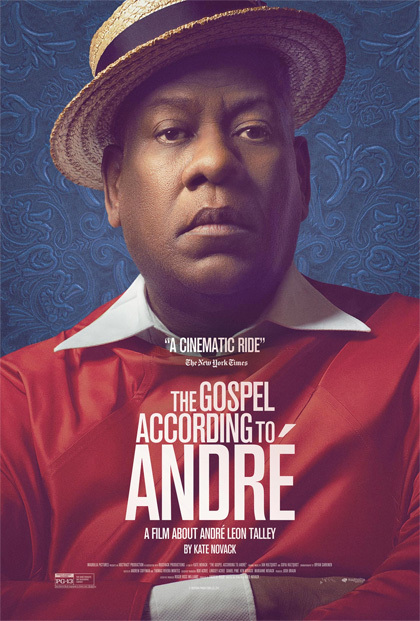 WASHINGTON, D.C. native fashion icon ANDRE' LEON TALLEY is the subject of full-length documentary film The GOSPEL ACCORDING To ANDRE'!!! The GOSPEL ACCORDING To ANDRE' is a cinematic monument to one of the most unique figures of 20th Century American culture. Will YOU be going to see The GOSPEL ACCORDING To ANDRE??? Just saw The Gospei According to Andre first take. And it's glorious! Preview of upcoming documentary on my life: the Gospel According to Andre, directed by Kate Novack, produced by Andrew Rossi. Stay tuned for local movie houses.Magnolia Pictures release. Debut at Tribecca Film Festival: April 25.